The Bijur Versa III is an electric (PDI) pump. The discharge volume is 125 cm³/minute. The maximum pressure is 20 bars. The standard unit comes with a dual voltage 110/220V single phase motor. The unit can also be assembled with either a 2 liter or 4 liter plastic reservoir. 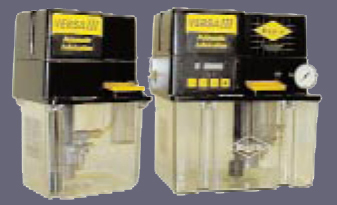 The 2 liter model can be assembled with a terminal strip or time based timer. The 4 liter assembly is supplied with a controller or without . (time-based or cycle based).